3D printing toys is no longer just for kids. Last weekend, at the Maker Faire Bay Area, Modio Inc. announced the launch of their new app for iPads. 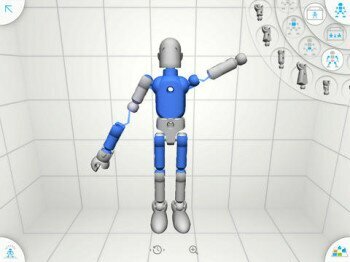 Modio is an easy-to-use app that allows anyone to bring their imagination to life with 3D printed model toys. Modio makes the design process easy for anyone to use, by allowing you to simply drag-and-drop parts and pieces together to create whatever your mind imagines. All parts are interchangeable, and able to be moved if you change your mind. You can even modify the parts, allowing you to create designs that are uniquely your own. Modio was developed out of the belief that 3D printing is an amazing technology. The idea came from a small group of entrepreneurs who believed that anyone should be able to create great content for 3D printers. But with few tools available, a lot of creative potential is lost. Modio allows anyone to easily create whatever models their mind imagines, and print them on desktop 3D printers. All 3D printed creations are fully pose-able, and the app supports multi-touch, allowing for many users to create and play together. Once happy with the design, simply send the image to your 3D desktop printer and in a matter of time you will have your 3D printed model in your hands.